We recognize that the success of a dental practice, along with the successful incorporation of orthodontics into a dental practice can depend on the education and training of the staff; with that in mind we designed this course to help fulfill those needs. Kay is a highly enthusiastic presenter, motivating, as well as knowledgeable, and enables her students to return to your practice with a renewed excitement and enthusiasm for dentistry and their ability to contribute to your office. 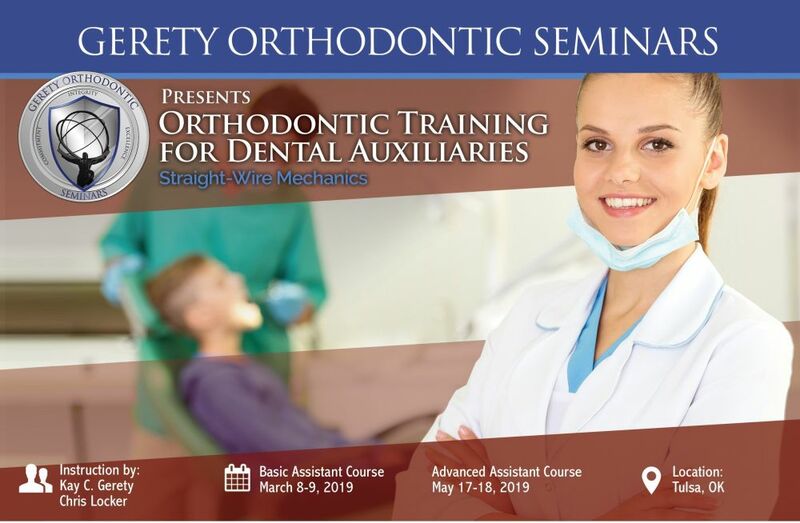 This 2 day course features lectures, demonstrations, and hands-on exercises and is designed to meet the needs of the doctor and assistants who are currently utilizing Straight Wire mechanics and would like to expand the delegable duties to be performed by the orthodontic assistant. While this is not a beginning course, it is an excellent follow-up for assistants who have previously participated in the Basic Assistant course or who have extensive experience in orthodontic assisting. Although it is not mandatory to have participated in "Kay Gerety's Basic Assistant Course," this advanced course is specifically structured to enhance and develop the principles and techniques taught in the basic course. Additionally, it will provide an excellent follow-up for assistants who have previously participated in the Basic Assistant Course or who have extensive experience in orthodontic assisting. It is recommended that participants be familiar with Cephalometric tracing, ligation methods, and general monthly maintenance procedures. Each assistant needs to be comfortable with basic orthodontic treatment concepts. This is a wonderful opportunity to provide your staff with additional orthodontic training and to encourage their professional growth. Register 4 Assistants and the 5th is FREE! Kay Gerety and Chris Locker will be presenting Kay's Advanced Orthodontic Training for Assistants in Tulsa May 17 - 18 in conjunction with the Gerety Comprehensive Orthodontic course, and we are looking forward to another great course! Kay is a highly enthusiastic presenter, motivating, as well as knowledgeable, and enables her students to return to your practice with a renewed excitement and enthusiasm for dentistry and the ability to contribute to your office. This 2 day, hands-on course for experienced Orthodontic Assistants is designed to meet the needs of doctors and assistants who are currently utilizing Straight-Wire mechanics, and would like to expand the delegable duties to be performed by the assistant. Although it is not mandatory to have participated in "Kay Gerety's Basic Assistant Course," this advanced course is specifically structured to enhance and develop the principles and techniques taught in the basic course. Additionally, it will provide an excellent follow-up for assistants who have previously participated in the Basic Assistant Course or who have extensive experience in orthodontic assisting. It is recommended that participants be familiar with taking basic orthodontic records, bracket and molar band placement, ligation methods and basic wire changing techniques. Each assistant needs to be comfortable with basic orthodontic procedures. Who Will be Registering for this Event?